This last week has seen the Diamond Jubilee celebrations for Queen Elizabeth II both here in the UK and around the world. The Queen is not yet Britain’s longest reigning monarch. George III lived to be nearly eighty-two and reigned for just short of sixty years. Queen Victoria reigned for sixty-three years and seven months, so our present Queen has only to reign for a further three and a half years to become the longest reigning British Monarch. Queen Victoria celebrated two Jubilees, following a period of relative unpopularity after the death of Prince Albert in 1861 when she went into deep mourning and relative seclusion. 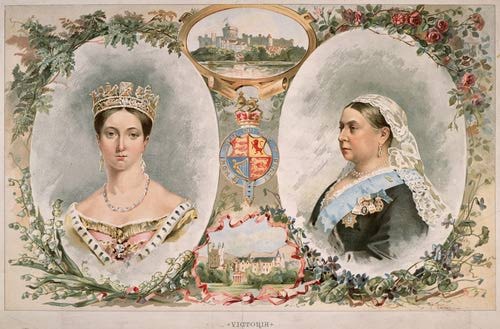 Her Golden Jubilee was celebrated in 1887 and her Diamond Jubilee in 1897. In 1977 when the present Queen celebrated her Silver Jubilee after twenty-five years on the throne, my four year old daughter peered through rain and gloom, similar to that experienced across Britain last Sunday, to see a distant Jubilee Beacon. By her side was my grandmother who in 1887 at the same age had watched the beacon for Victoria’s Golden Jubilee. This got me to thinking about those historical links that excite the imagination and allow us to jump backwards into history. When my mother was about twelve in the 1920s, and had been ill, she was taken to the seaside to recover. Staying in the same hotel was an old lady whose father as a young boy had fought at the battle of Waterloo. In 1991 I read the obituary of Alexandra Stewart, the last speaker of Perthshire Gaelic. As a young girl she had met Lizzie Lothian, who died in 1911 aged 93, and who remembered her grandfather John Lothian’s tales of escaping from the battle of Culloden in 1745. Making such lengthy connections for Jamaica’s early history is much harder since so many of the colonists died young. John Favell, whose Will was dated 1720, and who was probably born about 1649, is most unusual in mentioning a great-grandchild – Susanna Bernard, daughter of his grand-daughter Mary Bernard. He left her £150 in plate. Susanna must have been an infant when John Favell died and so unlikely to remember him. The only other Jamaica Will I know of that mentions great grandchildren is that of Mary Dehany (born Mary Gregory in Jamaica) who died in London in 1813 aged ninety. Her grandmother Jane Gallimore had also lived to be ninety and had lived through the reigns of six British Monarchs – seven if you count William and Mary as two! Good genes in that family. You can play a game similar to ‘six degrees of separation’ by thinking of the longest backward links you can make into our past through someone you have met. So I can get to the Battle of Waterloo in 1815 in two moves through my mother. Do you have anything similar in your family? Like skimming pebbles on a pond the ripples of our memories fade out into the past.